Cultural Capital is a one of the seven major capitals in development. In North Adams Massachusetts, cultural capital is very interesting to discuss because of its rich history and its current growing art community. New England is home to many old mill towns that lost their residence, work force, and the local economy crashed due to the closure of many factories. North Adams is an example of one of these towns. 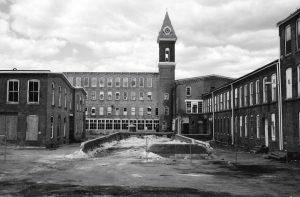 In the late 70’s, North Adams’ main factories went out of business which caused 26 factory sized buildings to be abandoned and the loss of 3000 local jobs (NPR). In 2014 the United States Census Bureau found that 18.9% of North Adams residents live below the poverty Line, compared to the national of 14.5% (American Factfinder 9/30). North Adams has still yet to recover since its collapse in the late 70’s. Although MASS MoCA did not have the impact people thought it would, some believe art is only way to reinvent North Adams. The Berkshire Cultural Resource Center is a nonprofit that supports local galleries (NPR). They have helped open two new galleries on Main Street. The needed reinventing of North Adams from an old mill town to an exciting art town will take a cultural change. MASS MoCA is a complex of 26 renovated 19th-century factory buildings. The site was formerly the home of Arnold Print Works (1860-1942) and Sprague Electric Company (1942-1985).